No heat, electricity or batteries required. This roll set is designed specifically for use with your Xyron 2500 Professional cold process laminator. A number of roll sets are available for the Xyron 2500 Pro laminator including roll sets for 2 sided lamination, permanent adhesive application, repositionable adhesive application and one sided lamination with adhesive backing. No heat, electricity or batteries are required. The wide variety of options available for the Xyron 2500 make it ideal for creating mock-ups, story boards, and posters. Plus, the fact that the Xyron 2500 doesn't require heat makes it one of the safest laminating options available on the market. Good buy for such an expensive product. This laminate is just the right product for our school! No problems with preserving the precious artwork of our preschoolers! These keepsakes will last forever! Our school laminates a lot of signs and artwork...and this product works great! Easy to use and no heating to worry about, it's perfect for the Early Education setting. Love this laminating film. Does a great job all the time. You need to be careful replacing the cartridge. Pay attention to how the old one comes off. you need to roll off a little more than you would think to make the wrinkles come out. Great purchase for such an expensive product. 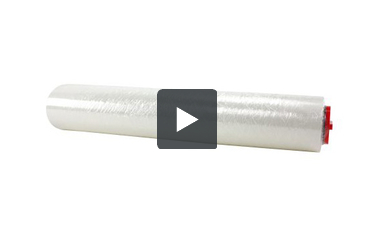 This is a how-to video on how to load or refill the laminating film on your Xyron 2500. Xyron has made it super simple by color-coding the ends of the laminating rolls. After removing the front service tray and the top cover, you will see film loading instructions right on the front there, and you will notice the red and green coding. Just match the colors, roll to slide. A sticker on the end of the roll will let you know if it is for the top or the bottom carriage. Then you just slide both sides in at once until it falls to the bottom. Turning the machine around or walking around to the other side, open the back panel and you load the bottom one in the same fashion, red on red and green on green. Close the door and you are all set. Once you have turned the machine back around, it is time to prime the film. For this part of the video, we have switched to a different laminating film. That way you can see the white and the clear as different when we talk about the bottom or the top rollers. From the bottom roll, you need to pull a lead out and lay it up over the fence. Then from the top roll, bring the lead down and lay it over those first two bars. You are then going to bring the white, or the bottom film up and over on top of that top roll of film that you've pulled out and this is where we are going to prime it. But let's watch that whole process again from a different angle. Pull a lead from that bottom roll so it comes out underneath the two silver bars and up over the black fence. Just lay it down as you grab for the top roll. You may need to wind it a little bit to give yourself some lead. Pull it all the way down and across, all the way out and lay it over, on top of those two silver bars. Then pull that bottom film up so it lays flat over, or in front of the clear. Now here comes the priming part: you will need some kind of cardboard or thick card stock or previously laminated item to use as kind of a wedge. You are going to use it to push these two laminating films in between the metal bars and then between the rollers in the back. Be careful to watch your fingers and as soon as you can use that handle, do so. As you bring it through, everything will begin to smooth out. The two laminating rolls will center themselves up and all the wrinkles and bubbles will work themselves out and it will be totally smooth. When the two rolls are all smoothed and primed, you can put your service table right back on and you are back to work. Thank you for your question. We contacted the manufacturer and Xyron confirmed that all of their laminate is acid free.